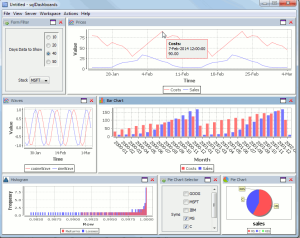 Download the latest qStudio now. Bugfix Sending empty query would cause qStudio to get into bad state. Default to chart NoRedraw when first loaded to save memory/time. Add copy “hopen `:currentServer” command button to toolbar. Ctrl+p Shortcut – Allow opening folders in explorer aswell as files. Allow saving .das without username/password to allow sharing. Prompt user on file open if cant connect to server. Bugfix: Allow resizing of windows within sqlDashboards even when “No table returned” or query contains error. If query is wrong and missing arg or something, report the reason. 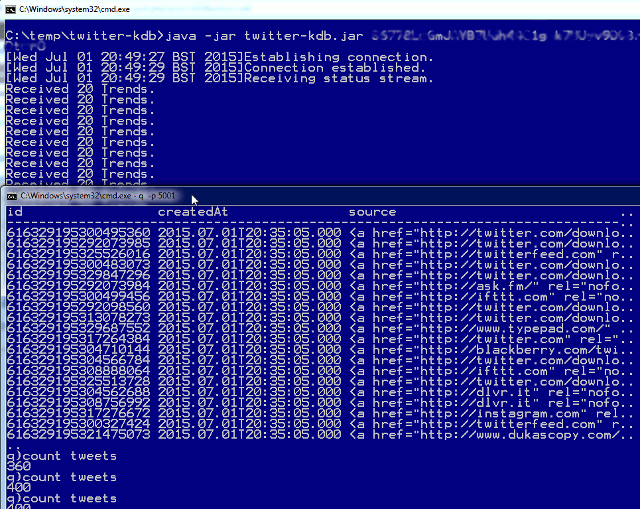 Stop wrapping JDBC queries as we dont want kdb to use the standard SQL handler. We want to use the q) handler. Open Source Alternative to kdb? Kdb has been tried and tested over many computer/man-years. The KX team have fixed 1000’s of edge cases, optimization issues and OS specific bugs. Any similar system would have to replicate a lot of that work. Possible but it would take time and teams actually using it. It would also require a corporate entity to provide support and bug fixes together with long term guarantees of availability (not a few part-time committers on github). Ontop of that it would need to deliver more value to make it worth switching. – There is no open source database that provides the speed kdb provides for the particular queries suited to finance. – Combining kdb and basing queries on q-sql/ordered lists (rather than set theory for standard sql) means queries require fewer lines of code. I believe this expressiveness combined with longer term use of kdb/q changes how you think and allows easily forming queries which many people couldn’t begin to write in standard sql. – However as much as I think q is a selling point of kdb, I know many others would disagree. It takes a reasonable period of time to convince someone non-standard SQL is beneficial. XYZ would need to support these queries well. Why would I chose XYZ instead of Python/R/J/A+? Existing (some similar languages) that offer a larger existing user base, more libraries and a proven/stable platform. Unless a way is found to leverage existing languages/libraries XYZ will be competiting for attention against kdb and also python/numpy/julia etc. For the target market of kdb the cost is often not the most significant factor in the decision. If kdb can answer questions that other platforms can’t or in a much shorter time, it often adds enough value to make the cost irrelevant. In fact many large firms are happy paying a pricey support agreement for free open source software so that they have someone to (blame) call to resolve an issue quickly. If XYZ started to be able to answer the three example queries shown above at a reasonable speed multiple perhaps but I consider it unlikely. Kdb is entrenched and for its target use case it is currently unbeatable. Some people may have use cases that don’t need the full power of database and language combined or have other important factors (cost,existing expertise). I think those use cases have viable open source solutions. Julia programming language is being touted as the next big thing in scientific programming. It’s high-level like R/Python but meant to be much faster due to its smart compiler. I’ve been giving it a bit of a tryout, as part of learning it I’ve generated a list of all julia functions and will be creating examples for some of the more popular ones. Previously we showed a demo of us getting data from twitter into kdb, we are now open sourcing part of that work, allowing you to quickly get some real social data into kdb to play with. Newry-based financial software firm First Derivatives has acquired a majority shareholding in big data analytics company Kx Systems for £36m (€44m). KX has historically had a hard time penetrating markets outside finance, FD have a good sales team and previously acquired a marketing company in Philadelphia, hopefully this is the chance for kdb+ to go mainstream. However it’s a worry that FD (First Derivatives) may increasingly “encourage” purchasing of the delta platform bundle rather than stand-alone kdb+. With the smaller margins outside of finance, will FD take a risk and open up the database. (Would FD have been a supporter of the 32-bit version becoming free for commercial use?) There’s a large number of individuals in off-shore locations that want to learn kdb+, FD could be incentivized to discourage that as it would hurt their consulting business. Competing consulting firms that specialise in kdb+ won’t take this as good news. Panopticon/Datawatch based their visualization system on kdb+ (OEM license), they probably regret that now, given that their visualization software directly competes with FD’s dashboards. Companies that had used kdb+ as part of their trading platform stack may consider FD a competitor as they also offer a trading platform. What do you think? Will this lead to wider adoption? a growing platform? 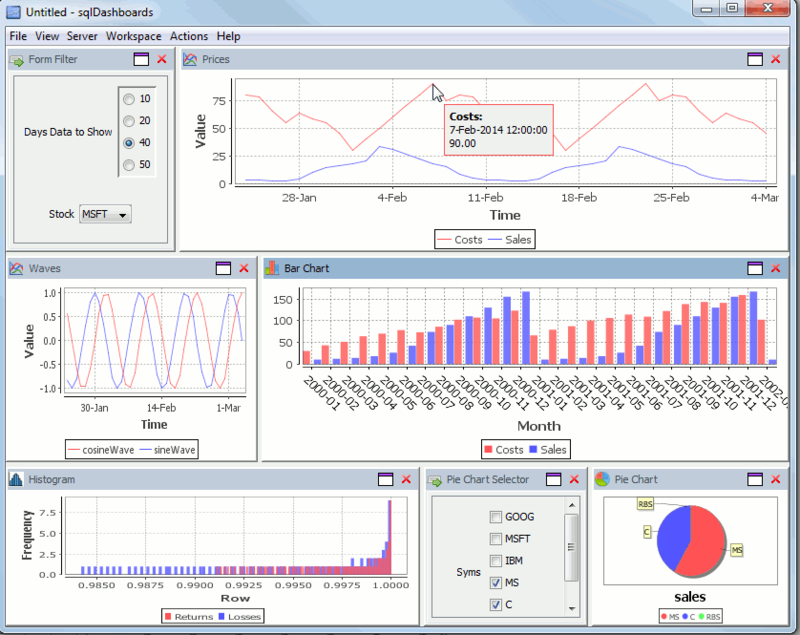 sqlDashboards is a tool for creating real-time sql based charts. The latest 1.31 release is available to download. Our new “Forms” now make the charts interactive. here’s an example dashboard showing some stock data, notice the form in the top left allowing selecting a stock ticker and the number of days data to show. On the bottom right is another form containing checkboxes for each country. We can change these selections and the charts will be updated instantly. 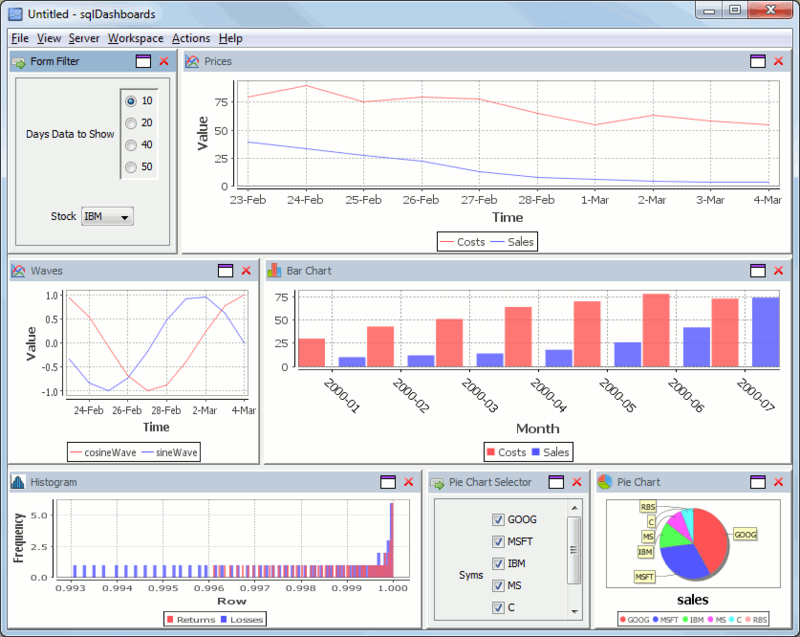 Full details on how to create forms can be found in the sqlDashboards help. If you use kdb see our “help menu”->Open example kdb dashboard option. We are going to continue to add new functionality…increasingly configurable charts, command line chart generation, web interfaces…if you have any features you would like added please get in touch, we are always happy to receive feedback. included in the next version, let Andrey know. Or just submit a patch. You are currently browsing the TimeStored weblog archives for the Uncategorized category.